We have finally moved back into our house after an extended renovation and I couldn't be happier. Unpacking was a mix of fun and drudgery - fun because there were things I hadn't seen for ages and it was like buying or receiving them all afresh! Drudgery because, you know, we carry too much stuff. I tried to apply the 'handling each item and seeing what it gives me' thing, but I was more keen to stuff everything away asap and get on with our lives. Still, I did discard a couple of things, which I'm proud of, and I will continue to cull once we're settled. And today, I started making again! It feels like ages and it was such a breeze to get everything ready, made and cleaned up. Just as well, I have a lot to catch up on! We are booked in to do the Gathered market in August and The Vegan Affair in September. I will start booking into other markets as they pop up. In other news, I understand there is an auction to be held next Sunday offering some wonderful items designed by the likes of Jacques Adnet, Andre Arbus and Gilbert Poillerat. Sigh. Aside from the fact that there is no way I would be able to get my hands on any of the goods on offer because a. the auction is in Rouen, France and b. I don't have a million euros; the auction makes me feel sad. 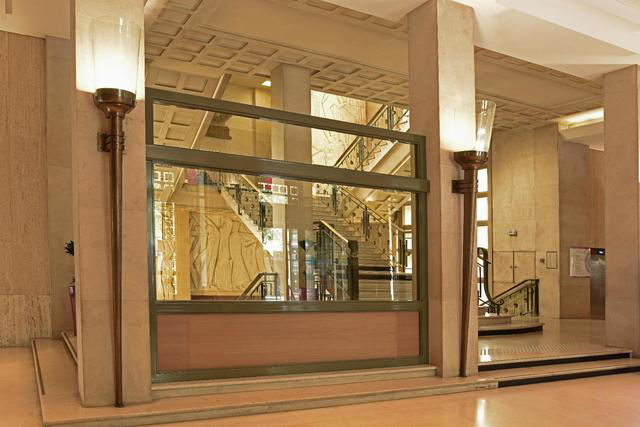 The auction comprises light fittings and furniture from the Palais des Consuls in Rouen, which was built in the mid 50s following the wartime destruction of the previous building. Swoon! But you can see why they would want to rip all this rubbish out. Also, speaking of loss, the Glasgow School of Art! Ugh, what were the chances? Two devastating fires in 4 years? We had the good fortune of visiting the school some years ago before the fires and, well, I can't really add anything, but Glasgow, the world in fact, has lost a monumental work of art.